If you live in Peachtree City or any of the surrounding areas (including Sharpsburg, Fayetteville, Brooks, Woolsey, Senoia, Tyrone), or any area throughout the state of Georgia, and you have suffered an injury or lost a loved one as the result of someone else's negligent, careless or unlawful actions, you can turn to the legal professionals at Webb & Taylor, LLC, for the aggressive advocacy and compassionate support you deserve. Over the course of our history, we have helped recover many millions in settlements and awards for our plaintiff clients. One thing that really sets us apart from other personal injury practices is that we have two registered nurses on our staff who help evaluate the merits of medical negligent cases and assist us in finding medical literature in support of cases. Recognized for our impeccable professionalism and exceptional legal abilities, we have received numerous awards and honors, including top ratings on Avvo and AV Preeminent peer review ratings* from Martindale-Hubbell, so you can trust us with your most sensitive legal issues and have confidence that we will do everything possible to help you achieve the favorable outcomes you expect. 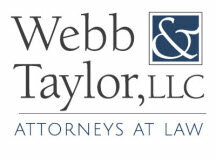 To find out more about how Webb & Taylor, LLC, can best serve you and your family in your time of need, you can contact our law office or visit our website to schedule a free initial consultation.